No other region in Asia will perhaps suffer as much from a changing climate and looming energy crisis as the cold high altitude mountain areas of the Hindu Kush Himalaya, where living conditions are harsh and many people vulnerable and marginalized. 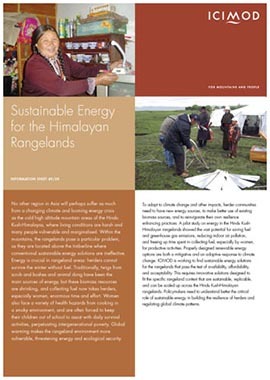 Within the mountains, the rangelands occupying over two-thirds of the HKH pose a particular problem, as they are located above the timberline where conventional sustainable energy solutions are ineffective. Energy is crucial in rangeland areas: herders cannot survive the winter without fuel. Traditionally, twigs from scrub and bushes and animal dung have been the main sources of energy, but these biomass resources are shrinking, and collecting fuel now takes herders, especially women, enormous time and effort. This project sought to develop a knowledge base on the household livelihood and energy situation, and carry out on-site testing of some feasible energy technologies using the lessons learnt by employing a participatory action research approach. The renewable energy technologies identified as suitable and thus piloted were modified versions of three types of metallic improved cook stoves, parabolic and wooden box type solar cookers, portable and fixed type solar lamps, bio-briquettes, milk churners, and meteorological data recording equipment. Within a short span, the project results showed vast potential for saving fuel and reducing greenhouse gas emissions and indoor air pollution, and freeing up time spent in collecting fuel, especially by women, for productive activities. The results provide a detailed account of pilot project learnings dealing mainly with major highlights of baseline conditions, the performance assessment of piloted technologies, and major experiences and lessons learned. It offers priority issues and recommended options for future action on sustainable energy service provision for the rangeland. Building on these positive pilot experiences, ICIMOD embarked on the second phase of the project (DESER II) from 2010 to 2011 to disseminate the tested technologies at sites in five countries in preparation for rolling out the programme in remaining areas of the HKH through multi-stakeholder partnerships, market development, commercialization, and policy, institutional and technological innovations. More recently, the project underwent an ex-post impact evaluation which is being processed/synthesized for dissemination. With overall objective to enhance the livelihoods of people and their environment by designing and supporting the development of environmentally friendly, socially equitable (gender sensitive), and economically sustainable energy resources and technologies, the project was carried out with Department of Livestock, Bhutan; Sichuan Grassland Science Academy, People's Republic of China; National Trust for Nature Conservation, Nepal; and Aga Khan Rural Support Programme, Pakistan.